Club Penguin Cheats by Mimo777 Club Penguin Cheats by Mimo777: Club Penguin Christmas Party STILL ON! And The New MIssion?! Club Penguin Christmas Party STILL ON! And The New MIssion?! Also, it doesn't look like the new mission will be out anytime real soon! WHAT'S UP WITH THAT?! This new Mission BETTER be good! I bet it will the best Mission eva! I think it will have something very new and different than all the other Missions. What do you think? Any cool theories? Have you mastered Fission Balls yet? Get your name on the Mimo high scores! Can anyone beat Stickers? Maybe We will have the robots from Elite Penguin Force help catch Herbert. Hey mimo i saw you at you chobots party! I was also following You on your twitter. We have to catch herbert this time! We may even be able to spot him and clutsy around the island? omg this is getting insane waiting for this, if this mission is lame I think I might have to hurt club penguin lol jk, but seriously I hope this mission is long and fun and awesome, you rock mimo thanks for posting. Well, the robots for the epf can help us out! Maybe at the end of the mission, we'll find out that a penguin hacker is going to be the new villian! iv sent club penguin a help question, it shoulent be to long for the new mission!!!!!! Ur chobots party was awesum Mimo! your right shlonkey!! we shuls all send help question to cp saying to put out the new mission! The mission should come out some time after something BIG happens to/with puffles, probably the Friday after it. Well, I noticed club penguin usually updates itself on Friday. Like the penguin style catalog, the parties, and the pin, and some other things. Mimo did u know that when u throw snowballs in th forest they come out as ornaments for the tree? Its so cool!!! I'm getting really sick of waiting for a new mission. Its been nearly a full year!!!!!!!!!!! COME on CP! No new items or new missions!!!! Hope you guys can make it! Hey Mimo.In the coffee shop,the train the is on the ceiling blows its Whistle when you click on it. this won't be the last mission im sure of that because of my idea. Thouse packets of seeds are going to melt the snow on the island so the penguin will have to catch them until herbert runs out of them! I think the mission will be out after the party, well I HOPE that it's out after the party. I think that Elite penguin force and PSA are going to team up to catch herbert, not because he is so hard to catch, or that rookie is messing up so bad, because he has the robots! EPF knows that him with the Robot makes evil. There willing to plow up there secert to save CP. Dottie, if I remeber correctly will make us disguse so good that herbert will fall for it, like a gaint gold puffle! It his time to be put were he belongs, jail. Who is with me! k this is annoying i mean come on it HAS been taking forever!! for me CP is getting old but maybe my mind will change if the mission COMES OUT!!! Pretty good idea! I like it! First of all, her name is just Dot...although everyone just calls her D. Second, that idea isn't that bad! I'm with you! "(My buddy's name) is challenging the Sensei." The new mission should be out any time now...the last mission came out, I think on December 29, '08, so it could be tomorrow...? New Dojos...? Oh, the water and snow Dojos! I don't really know that there will be any new Dojo's; there might! I emailed CP a while back about it, and they said "they can't reveal anything, but we never know what could happen. "...Or something like that, I really can't remember! But still! Probably...? Mimo i just want to tell you YOU ROCK! if u see me on chobots my name is Bube07! how do you create your own banners? I STILL CAN'T FIND RH!!!!!!! WHERE??? ARE??? YOU??? Lol, Mimo just a reminder, instead of typing "Mission" you typed "MIssion!" I know not a big deal, but the I is capitalized...jeez you make a lot of tYpOs, jk! You rock! Jamchip & Karate song: Only put CPG Mod after ur name when u r modding. Hey Hnw! The mission last year was actually on Dec. 27, 08', but you're right, it IS 2morrow. Later, "sister"! Yo! Mimo will only add you if you become a Mimo Mod. Fist bacome a mod, and if you're good, you will work your way up and eventually become a MM! I hope the mission will come soonotherwise i'll have a fit! just kidding but ill will kinda be sad. I`msure it will be awsome and I thin we will will win the gglasss nuber two.My agency can help to discover what will be the next mission. you can search up on google these keywords: "how to make your own banner." i would just tell you the site directly but mimo doesn't allow URLs on comments. i think they're ok...not exactly the best. I think as soon as the party is over, they will have the new mission!! idk when the new dojo's are coming out but i know they'll be cool. maybe the water dojo will be like an aquarium. that would be sooo cool. Mimo, maybe ifyou have the Elite Penguin Force Game you can unlock missions in the secret EPF Room. There better be a mission before 2010. I am back from the mountains! Ok that is so weird! In the poll there was an answer that said i like pickles. I JUST ate a pickle in the car on our way back from the trip. Feathergreen here again! I just checked my Aunt Arctic tracker and she's online as well! Bye! I'm home! Will mod tomorrow! That is pretty weird...... because whenever you click their player card and they are in an igloo it says " In their igloo." I look in their igloo and they are not there. They need to put the name of the penguins igloo they are in. Cool! I hope that I can make it! Oooh! I knew it was sometime around there...cool! I can't wait for the new mission! ...Oh, yeah, I remember the vote for the glasses! I was wondering, "Wait, what does he...or she...mean glasses? !...Oh, yeah!" I can't WAIT! You know, if CP doesn't release the new mission before Friday it will be a whole year without a mission. The last mission was on December 30 in 2008 (just before the New Year). It's is supposed to come out tomorrow, (29) but it may not have a mission message!! Who knows?? i think maybe on the first day of 2010 they might publish the new mission. Hey Mimo! maybe Dot from the EPF got a haircut and got an extreme makeover! what if... what if... ITS NOT THE BEST MISSION EVA?!?! oh man i think i would cry... IVE BEEN WAITING SINCE.......... MIMO STARTED POSTING STUFF ABOUT MISSIONS! sorry 4 writing in caps. all this talk of mission makes me wanna eat pickles!!!! Maybe it is based on the Penguin Standard Time?Anyway I wanted to say I'm too excited for the party! Hey mimo how come you havent posted about your party on your webo blog? ya i hope the new mission is going to be fun and interesting! maybe after we catch herbert, we will have a herbert medal for reward! Yes, he is a member. Mimo is a historical figure. Sort of. He never changes his clothes and never will even if he gets a awesome Mimo necklace on cp, I think. It's easier to recognize him that way in a crowd. I think CP will do something like that. this is my idea: rookie is tired of making mistakes as a rookie. so, he quits. then herbert hooks him onto his "gang" and rookie get tricked. then the rest justs follows suit. I think CP doesn't say the exact person's name because some people would like privacy. i dont really like it when a random person adds me as a buddy then follows me to a friend's igloo. CP does that because some people can't get on the computer during weekdays. they put something out on the weekends because those days are the days where most people are on. mimo, i think that we work with EPF or maybe u have to play with another penguin like in card jitsu. I think we will capture herbert and clutzy his om and dad will come and make him plant the seeds and clupenguin has an anybody agent day where anyone can become an agent they still take the quiz but they dont have to be sertant days old the we can buy polar bears and crabs and the petsop for like a week only awsome theory huh? I think Club Penguin Directers fell asleep! Mimo that high-score isnt Mine...My friend (I dont want to say their name) found a bug on fission balls and made ppl get lots of high scores! Then they made me 1st! I think that this will be the best cp mission ever! hi mimo777 i got a weird glitch here it is when you go on clubpenguin homepage you will see that rockhoppers ship is there But it says coin for change still on it which coins for change isnt on anymore. I think that the new mission will be realy good, also i think that some ppl from the Elite Penguin Force game will be in it too. I think new mission is gonna be sweet!! Maybe those robots will be involved, but i want herbert to escape so the we can have more mission! I can't find any mission and it's the 29th today! Boohoohoo! Do you think you have to do something secret to find it or am I just hanging on to false hope? I think agents will have the chance to become part of the elite penguin force and get missions from that too. hi mimo :) me and my sister have noticed that the screens in the HQ have been updated and they now go to places like the dojo cortyard and the lodge attic! YAH! Where is the new mission?! REAALY!? I didn't know that! I am real annoyed waiting for this mission. Although happy party is carrying on! Hey, Race! Great to have you back! The party was supposed to end like three days ago! And it looks like the mission isn't coming out this year. It's 2010 in 2 days! My theory is that this mission isn't gonna be so great. OMG I AM GOING TO FREAK OUT IF THE NEW MISSION IS NOT OUT BY TOMOROW!!!! Mimo CP really needs to get this mission out. PS You've gotta listen to Right Round by Flo Rida it's addicting! Hey guys you know i said i was having a Christmas party? Well... umm it didn't happen. That day my brother got me banned from the computer. I'm really sorry. Though I'm not sure Mimo even posted about my party! SRRY! If you are are wondering why I wasn't modding yesterday my brother got me grounded. Exactly! LOL, that's probably what everyone is thinking! But imagine how difficult it is for Disney to do things like this... they have thousands of things to do at one time! Thanks for the awesome Chobots party, Mimo! It was my early birthday present! January 1st! WOOT! I don't think that we should send complaints and questions. Club Penguin/Disney have enough on their hands already. I don't know, maybe I'm crazy and don't know what I'm talking about... but whatever. Me too! They're nasty! Haha... I like cucumbers! Mimo was a member at one time, but now he's not. CP would want the new year to start of big, and to do that, a long awaited mission would do the trick. Mimo, give it time to release on New Year's Day. After that, then there's time to question. Maybe there won't be a message for upcoming release, just for the day of release, maybe to startle everyone. This is my guess. uhg! i hate it when clubpenguin says that they will do something cool and then they just fail on you!!! i was really hoping to do the mission today!!!! but sadly, i can not!! ~~~~~~~~~~~~~~~~~~~~~~~~~~~~~~~~~~~Why do you keep calling her "sister"? ... guess my info kinda didn't work but it might still so I just gotta wait. How can i become a mod? I'm a regular loving and sweet smart girl from California. They are the SAME thing! Cucumbers are just pickled with vinegar and salt to become pickles. You guys need to give CP a break. Maybe it is taking so long becuz it will be the best mission ever. Anyways, Club Penguin has been busy. Yeah... just like the plane that went 100 miles out of their destination. They said they were checking out the new site for pilot radar. They totally fell asleep. Mimo guess what! Yesterday I was at Hallmark in my mall and my mom was looking at ornaments and the I found a club penguin Hallmark keepsake ornament! its a dark blue penguin with red, green, and purple puffles over its head! its really cool! I think that Club Penguin is extending the Christmas Party because of those robots hidden around the island. They might have something to do with that new mission coming out. I think it has something to do with Herbert, seeds, and the robots from EPF! maybe herbert is going to use the robots from EPF, to capture Gary, then when all hope is lost, we use the finger(or paw)prints on the seed bag to locate Herbert's locations and capture Herbert once and for all! COOL! I will defiantly (TRY)to stop by! I"M !HYPOR! TODAT! YAYAYAYAYYAYAYAYAAY! MODDY FRENZY! No, you aren't supposed too! That's cooL! I didn't know that! 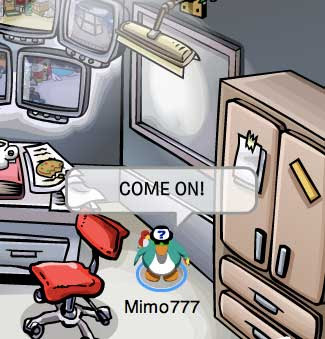 MIMO MIMO the home page on CP is normal again!But the :holiday: party is still here!!! Hey Mimo, Look at cp webpage its back to normal and when you log in its all there werid lol i think its a glitch hurry before they change it! I think so! We have to catch him but... if we catch him, what will be upcoming missions about?! I think there will be a new evil character! What do you think?! I think so! They worked for a loooong time (How long[?]) and upcoming mission will be the best ever! And our new character (Did you remember the name?) will help us solving problems! COOL! Great ideas, you all ROCK! this is so hard waiting!P.S today i turned 960 days old on club penguin!40 more days until a big celebration! i bet it will be on 31st because that is a thursay and lots of time new stuff comes out o a thursday! if itis not i will be mad!